Cozy Sweater Dress and Knitting Machine! Yeap! 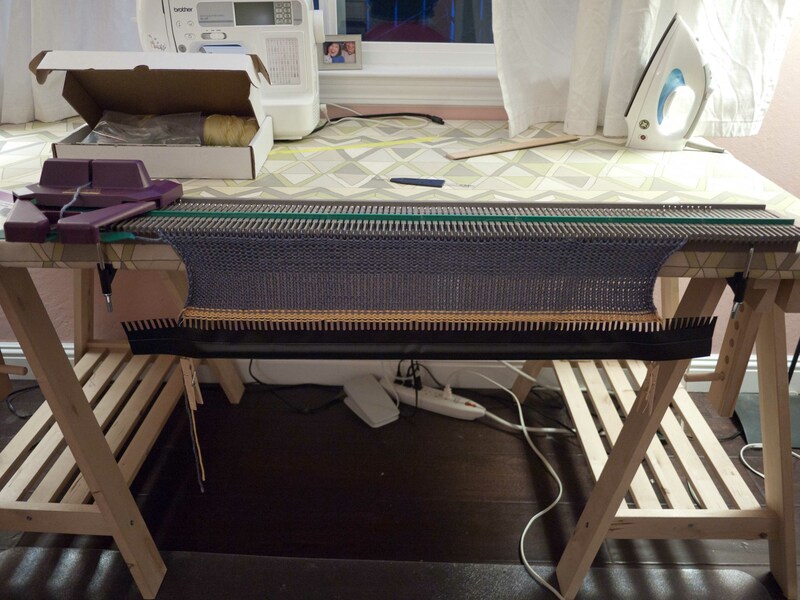 My new toy is a knitting machine! I had been looking for one on craigslist for forever, one of those nice brother ones for less than a hundred. But I havent been able to find one in months. So I gave up and used a 50% off coupon and bought the ultimate sweater machine for 100 at the local Michaels. You can get one for 150 on amazon that comes with more stuff, but the reviews are not great, and I didnt want to deal with return shipping in case it didnt work for me. There was quite a learning curve, but since I am stuck on the couch feeding Kaylee a lot, I was able to watch its how to video over a few times, and I think I have mastered the machine! For anyone out there who is considering this machine, here’s my review and some debugging tips. This machine is very simple to operate once you’ve learnt the how to. Once it is setup and I’ve gotten the keys to move smoothly(knitting a test piece), I knitting a sweater out of it between feedings and diaper changes in 2 weeks. 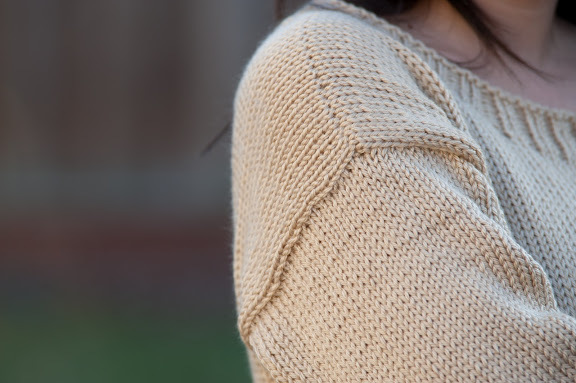 I think if I had an entire block of time dedicated to working on it, I really could make a simple sweater in two nights! The machine by default makes stocking stitches, and with a little work you can make ribbings and cables. However, you will not be able to do stitches like garter stitch or moss stitches, at least that would be much slower than hand knitting. To get an idea of how it works, watch their howto videos on youtube, that is the best way to find out! The machine also doesnt do well with chunky weight yard — it tends to split the yarn. Good thing that chunky weights are faster to knit by hand! Another downside is that you have to secure the machine to a table using clamps they provided. So if you dont have a sewing space, it could be messy having it on your dining table as you finish your project. A lot of people on amazon said the machine didnt work or dropped stitches. I can understand why they were frustrated by the machine. When I first got it, some of the keys had this grey foam stuck on it and comes out when it is moved, causing the key to not much forward smoothly. That caused dropped stitches. All I had to do was to knit a large test piece, and pick out the grey stuff as it comes out. I also discovered that I tend to press the top of the machine too hard when pushing it across the keys, which cause it to lower and catch some keys on the edge. Thats it! I think I am going to keep the machine, even though it has much limitations. I cant bring myself to hand knit anything that is less than chunky, and this can make quite a few things without breaking my bank! Here’s the sweater dress I made. This time I used simply soft, a polyester blend. I really like it, as it is soft and light, and not scratchy like wool. 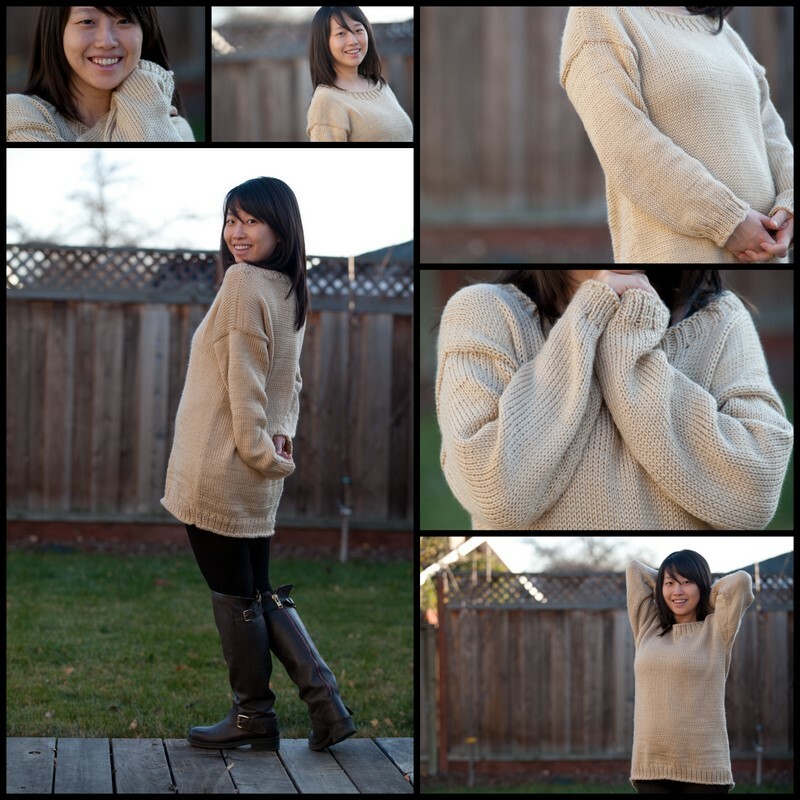 I had been looking for a loose sweater dress like this for a while, but I havent been able to find a flattering one. I used the pattern that came with my machine, but made the body longer, sleeves shorter, and the neckline wider (so I can pull it down for breastfeeding). The knitting is very neat, there are occasional rows where its a little too tight, but it was due to my cat pulling on my thread, thus messing with the tension. Am I going to finish up the sweater in the last post? Definitely not by hand. I think it can be converted to use the machine for the bodice and sleeve part, but I am still on the fence for that as well. I might just finish up the cable chest part as a head turban! This entry was posted on Monday, December 26th, 2011 at 11:34 am	and posted in Bond Knitting Machine Pattern, finished pieces, hardware, knitting. You can follow any responses to this entry through the RSS 2.0 feed. « To knit, or not to knit? I have made a ton of sweaters with my Bond knitter. it’s a great little machine. One thing I did which was definitely fun and different was that I had spun some wool/mohair and I knit that up in two big pieces and then I made ‘boiled wool’ by throwing it in the washer and the dryer. that project sort of went by the wayside but I found the plastic bag with the two pieces of ‘boiled wool’ this weekend while I was cleaning and I’m thinking of what to make with them now. I could make a bag with them, or the fronts of a jacket (if I could find a coordinating piece of material for the sleeves and the back). So, the IKM is actually a very useful thing to have. thats a great idea! i just recently discovered what “felting” means, i think this is what you mean, right? though the pieces that can be produced using this machine would not be very big, i imagine? Very cute sweater dress! Great neutral color. I’ve used that simply soft yarn for a baby blanket before- it’s very cozy! My MIL has a knitting machine, and I keep thinking I should ask her to make me up some of the cute projects I see on Ravelry, but I didn’t realize that the machine can’t do all the different stitches (which are probably the only ones used on the projects I’m eyeing.) Have fun using your new machine, and be sure to let us know any new tips you learn! Very jealous that you bought one and even more jealous that you managed to make it work for you. The sweater dress looks very RTW. Great job. My mom bought a used one a long time ago and gave it away. I’ve been looking at the same one in Michaels, but was hesitant because of the mixed reviews. Can’t wait to see what else you make.